Occasionally I reserve the right to indulge in some gloating on behalf of my particular Air Force calling. 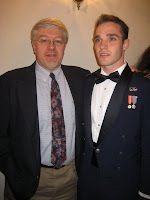 This time I will do so on behalf of my friend, brother and blogging colleague, the Jailbreaker, whose son Billy just graduated from the Air Force Academy, and was commissioned a second lieutenant! Jailbreaker Jr. spent nearly his entire childhood in Japan, following his parents' calling to minister the gospel of Jesus Christ there. He attended Japanese schools and speaks the language fluently. Mr. and Mrs. Jailbreaker had to work very hard, therefore, to ensure he and his lovely sisters, Anna and Carolyn, received additional American instruction so that they would be able to integrate back into our society when the time came. All three have done marvelously, and are a tribute to their own hard work as well as their parents' dedication to Christ and to their children. I am supremely proud to call them all my friends. Oh, and as long as we're on the Air Force topic, my change of command is fast approaching. It will take place at Bolling Air Force Base in Washington DC at 10:00 AM. For those interested in attending, the invitation is open. (Note: If you use Firefox, it may give you a security warning when you click the link ... please be assured the site is perfectly safe and secure).